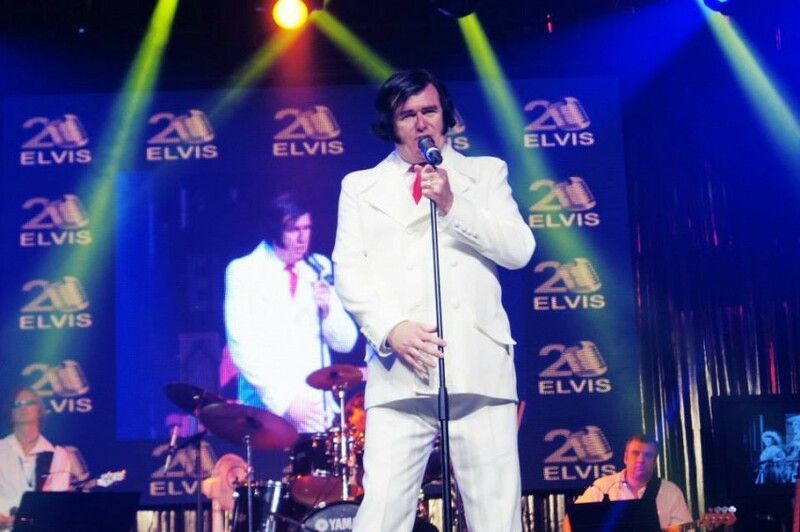 A multi-award winning Elvis Presley Tribute Artist performing throughout New England and Ontario in both large and small venues, I am known for my humor and vocals. 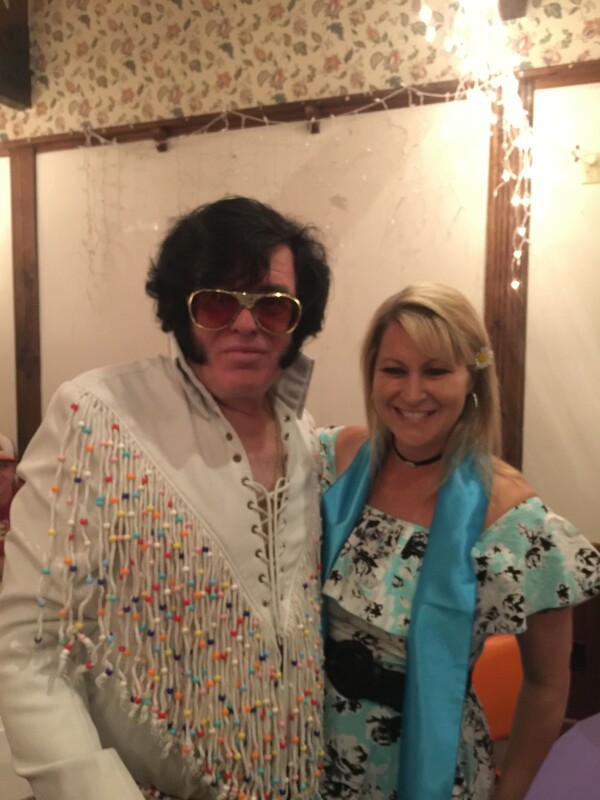 My shows include singing in the style and vocals of Elvis Presley in authentic Elvis costuming, with the sole aim of making it an enjoyable experience for all. Folks are still talking about how much they enjoyed this event. "Elvis" was right on target; identifying people , (other than those previously identified by sponsors), for,"special", attention. 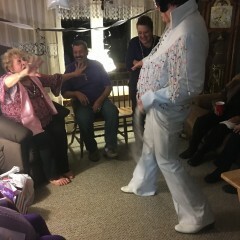 He is very sensitive to his audience and connects with them in the true Elvis tradition. Hi, Dorothy, so nice of you to say this! I loved working with you and Nancy on the event, I hope to get a chance to do it again with you. You had a great crowd of wonderful people, I could not have gotten a better reception. Also, I can't remember who gave me my "birthday" gift, but thank you, and I can't wait to show it to my Elvis friends! Thank you again for everything! Hey, Mike, when I got up this morning and saw you reviewed me so quickly, I was a little nervous... lol... but I am glad everyone enjoyed the show, which is always my primary goal. 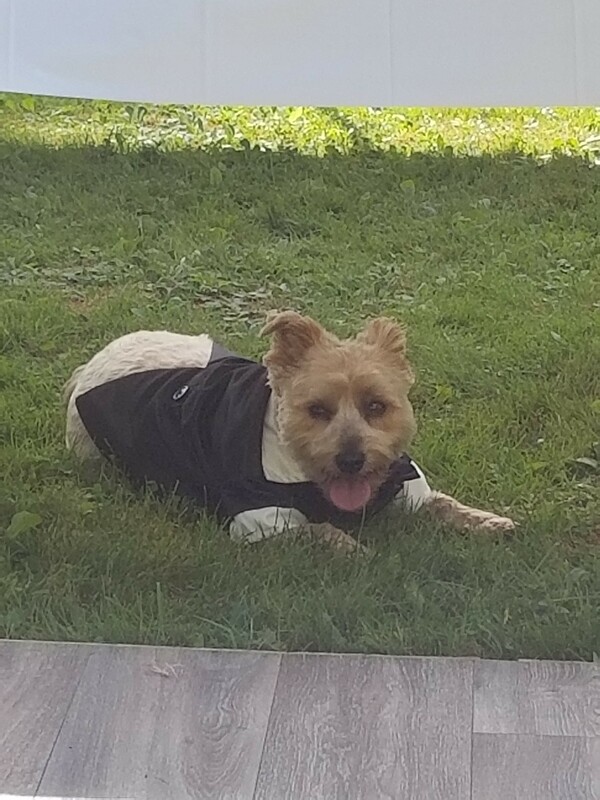 You had a wonderful group on hand, making my appearance that much more comfortable, and I thank you both for your hospitality and for the great review. I'm always available if you need my services again. Thanks! Keith was absolutely fabulous! What a great performer!!!! We are already talking about hiring him for other events. Thank you very much for your kindness, Bonni. I truly enjoyed the opportunity to entertain everyone, and you have a wonderful group of people. I hope you all had a wonderful Christmas, and will have an awesome New Year! Thank you very much, Bob! Fortunately my voice was back to normal after the first couple of difficult songs (with the tea and honey kicking in) so I could keep to the planned set list, and I was happy to add the extra songs in after the regular set. Every one at the party was fantastic and your Mom and Cheryl are real gems. I was so happy to be able to have the chance to give all a memorable experience. Again thank you, thank you very much! Think he was haveing a bad day! Not very good, Singing was very poor. As you know, I was very ill when I was scheduled to perform, and although I hoped, I was not really over it when I arrived on the day we rescheduled to. I wish I could have given myself more time to heal but as I was going away for an extended period of time I did not want to wait too long. Sorry it didn't work out as planned, but this was a very rare situation for me as denoted by other reviews. great guy was early amd stayed late couldn't have asked for anything better. Thank you, Jim for the great sentiment. 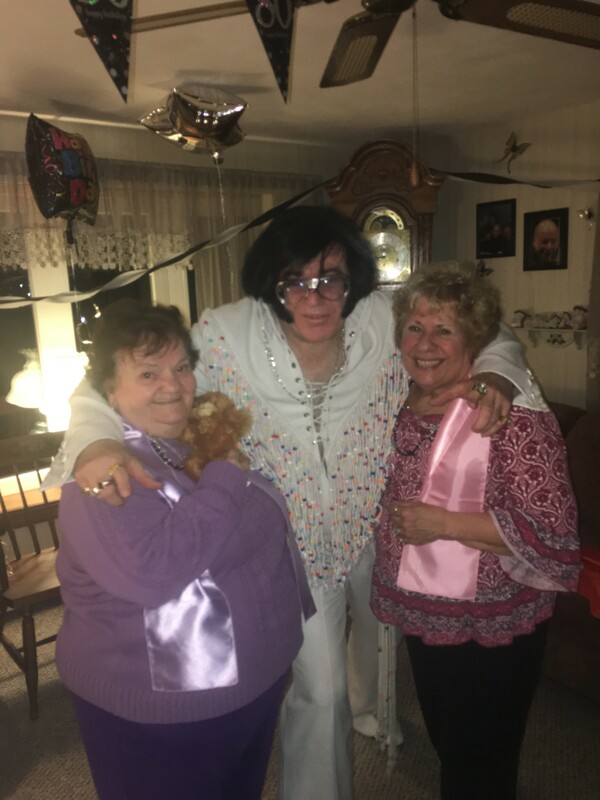 I really enjoyed performing for Sharon and the family, and there was no problem with extending the performance, especially when seeing how much fun everyone was having. I was happy to be able to make it such a special night for Sharon! Everyone enjoyed his performance and he stuck around after for photo booth and conversation. 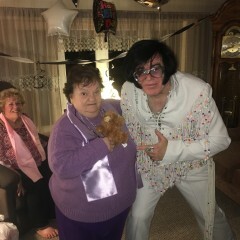 Thank you Norma, I enjoyed greatly entertaining your guests, and as I said that night, I was very impressed with your son, Elvis. I am happy when my client and all the guests are happy, and I was elated after all the fun. And again, congratulations! The heart and soul of Elvis! Keith was early to gig, ready to go! He was very polite and signs WELL! 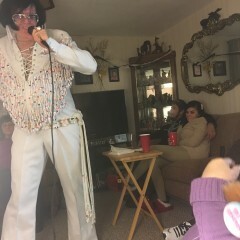 It's a real Elvis performance! Thank you very much, Geri! We had a rocky start with parking and all, but once all the guests were on hand, we gave Arthur a time he will always remember. I'm glad you were so happy, and thank you for the nice compliment! Keith was great! 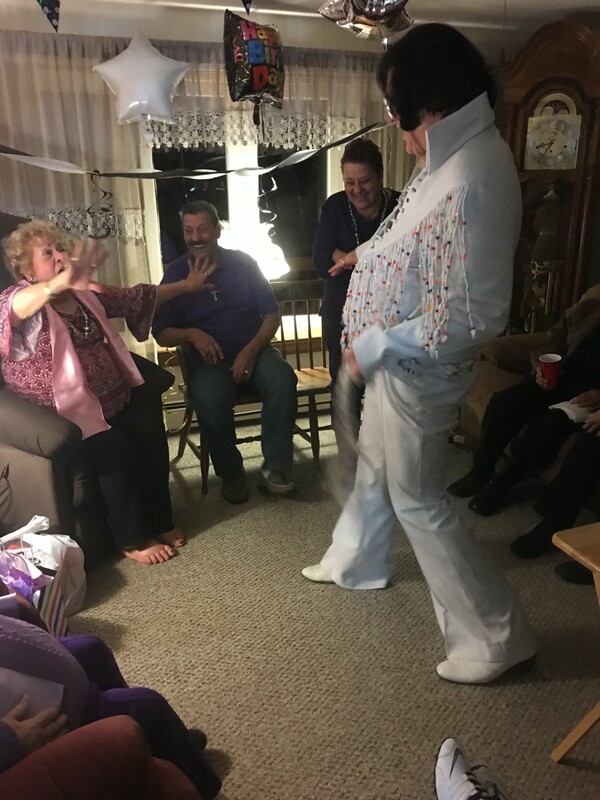 He went above and beyond and made the Birthday for the young, aspiring fellow Elvis Tribute Artist. Wonderful personal touches throughout and he strives to make everyone feel special. Keith is a great communicator and I would definitively hire him again. Bravo! Thank you very much, Heather! 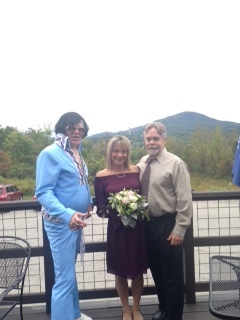 It was my honor and my pleasure to bring Elvis to this wonderful group of people. I'm glad my contribution made you and them happy. 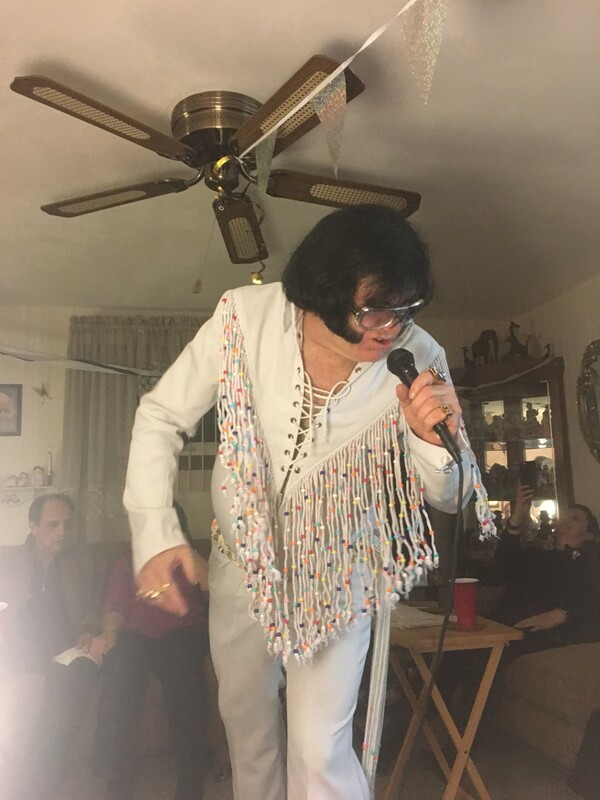 We had a great time listening to Elvis croon during an informal gathering of friends for New Year's Eve. The space was small and the house crowded. Everyone adapted and fun was had by all! Thank you very much for the kind words, Rachel! We were determined to work together to maximize the experience, and we succeeded! The kindness shown by you and Chris was one of the key components to making it work, and I'm so happy to make it a fun experience for your group. Hapy New Year! 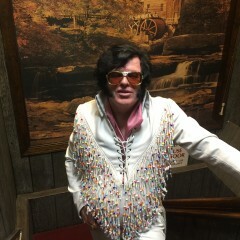 Elvis (Keith) was great. 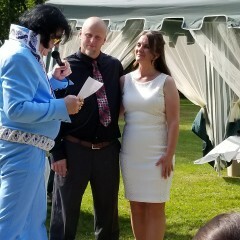 Performed the ceremony, did several songs and then ate with us. We had a small affair, only 14 people. Everyone in the restaurant loved him too and were coming in and taking pictures, even requesting songs. 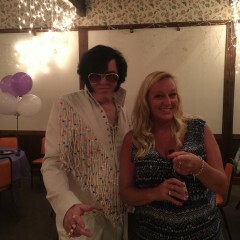 If you're looking for an Elvis impersonator look no further! Thank you very much for the kind words, Donna! You have such a nice family, it was my pleasure to entertain you and conduct the ceremony. I am glad that everyone had such a great time! He was alright, we had a fun night. he was personable. Dino impersonator would have been better without the wig that he wore, Wearing that wig, he did not come across seriously, comments were they thought he was a comic. But listening to his voice, he was very good. 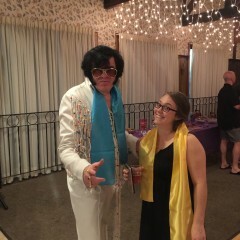 Elvis was much more convincing. I'm sorry about that new wig. It didn't help that it was shipped to me very late, and before I actually put it on Saturday, I was told that the overly curly, overly abundant hair would flatten out more once I had it on and combed it. I am forwarding your remarks to the manufacturer, who had been recommended by another tribute artist. Also without a mirror available where I changed, I was not aware how bad it ended up looking when the curls sprang back on their own. 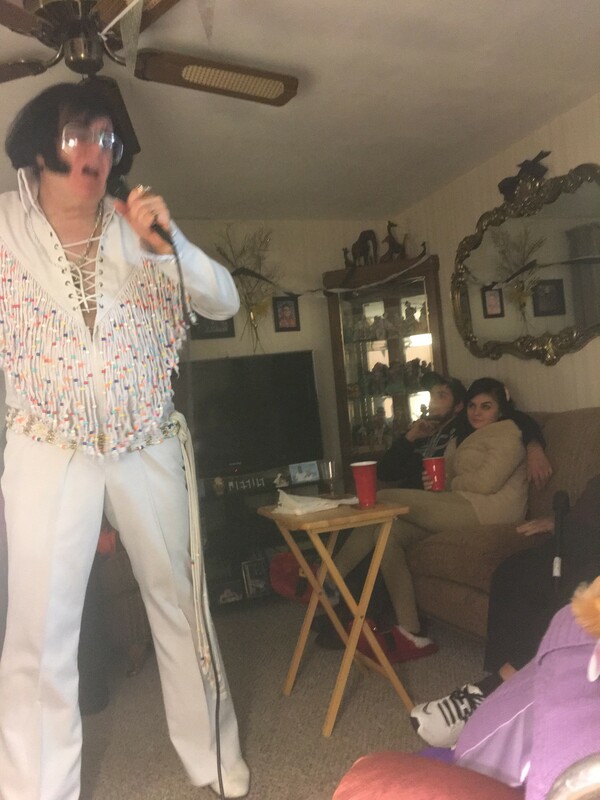 I indeed would have been better off without it, and even if I looked more like Elvis, my Dino sound and one-liners would have carried the act. Had a few unexpected issues arise but we overcame it. Over all, great time! Very friendly, easy going. Keith did a great job, I would highly recommend him. Thank you, Bob, and thank you for the opportunity! You have a great family, and I enjoyed brightening their day! He was Awesome! Just what I was looking for! 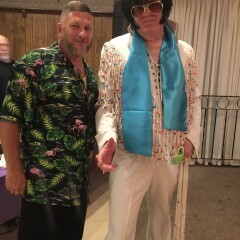 Keith was very professional as Elvis and very nice and helpful out of character! He blew me away when he was the only Elvis who responded to be with a phone call and blew me away with his profile! From then I knew he would be great! At the party he got to know my guests and helped us set up before his performance time and before the birthday girl arrived. He also helped clean up and stayed to chat after the party and his time. He performed his best even through my family not being such a rowdy crowd or the birthday girl being too rowdy. He learned songs on the spot for us that he has never done before! 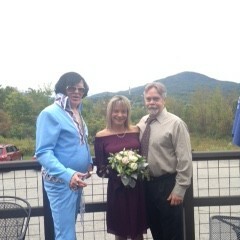 I could not have asked for a better man to be Elvis! 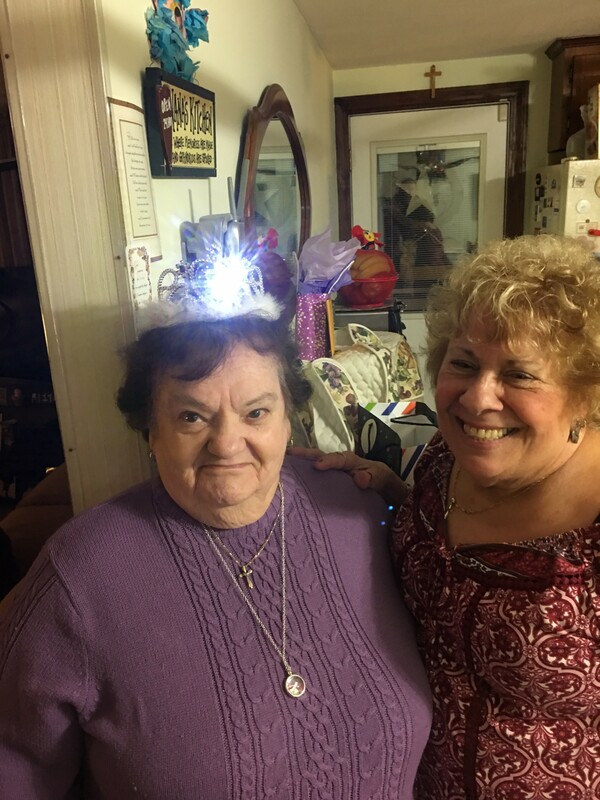 Thank you for giving my mom an unforgettable birthday! I would most definitely recommend him! Thanks for such a flattering review, Rhiannon! Bonnie Jean was a delight, and your family and friends made me feel so welcome. The least I could do was help out as you worked within your time contraints, and to learn one of your mom's favorite songs. The response and smiles were definitely worth it! Again, thank you for the opportunity to entertain at your event. Thank you, thank you very much, John! 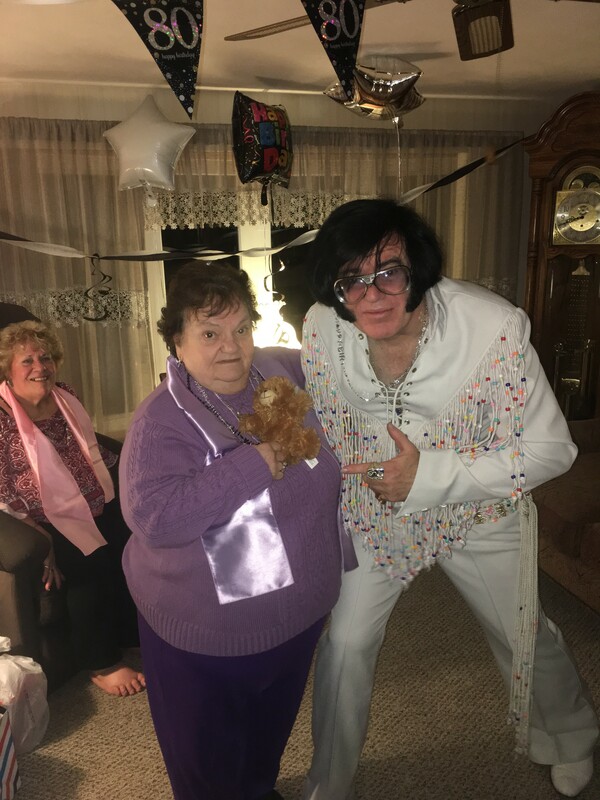 It was a pleasure to entertain your mom and party guests, and I'm so happy that first, you selected me and second, that I brought a lot of smiles to the event. 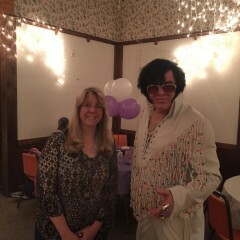 We had such a great time with Elvis at our party - for my mother's 70th Birthday party. 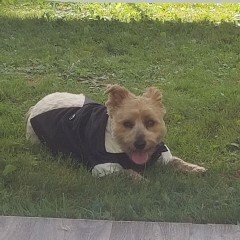 He was feeling a bit under the weather, but, still showed and worked the party, he even stayed way over time. The whole crowd loved him!! Would definitely recommend him for future!! Thank you.. thank you very much! Thanks for the very kind words, Christine, every one of your guests was fantastic! I just hope folks realize that when you say I stayed "way over time," you mean that I sang a few extra songs as an encore, and that I wasn't the American Pie marching band refusing to leave the field... lol... I'm glad your mom enjoyed her special gift! 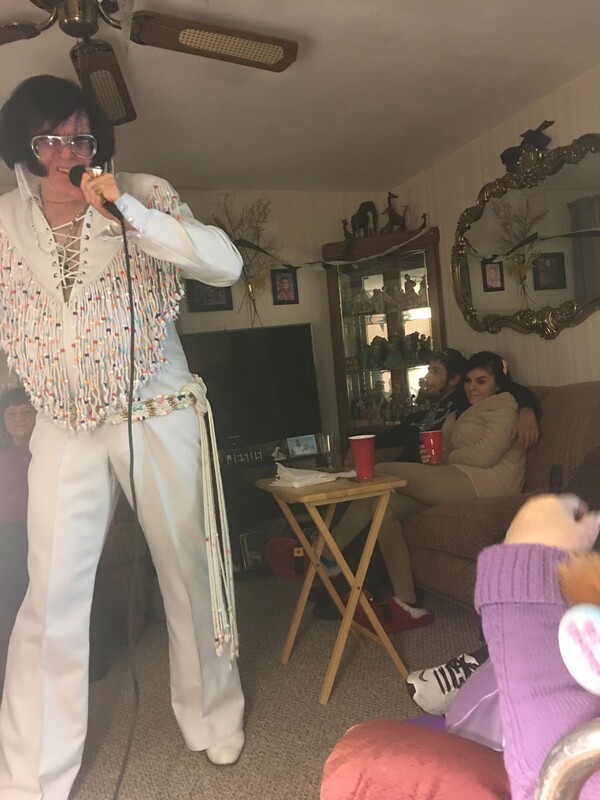 Elvis wowed his fans on Fat Tuesday. We had a very fun event. Keith Lewis was great with our folks. Very personal in way that he singled out people and sang to them and gave out colorful scarves to several people- really made their day. I will be looking to book him for a future event over the summer. I'll be back in touch with you then! I have great photos, but I do not have permission to share beyond my agency, sorry. Thanks for the kind words, Paula, and thanks for expressing your interest in a return engagement. I look forward to it! From my first contact with Keith, it was evident that he was a caring and sensitive person. 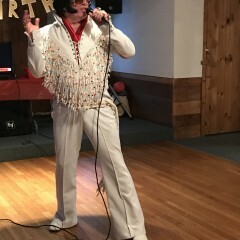 Since he was performing at a Celebration of Life event, he asked for info about the deceased, who was a huge Elvis fan, in order to tailor his performance to be appropriate and personal. 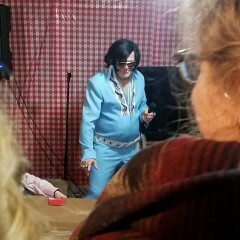 He totally engaged the audience, and captured the Elvis persona. Keith went above and beyond, staying after his performance, interacting with people, posing for photos. 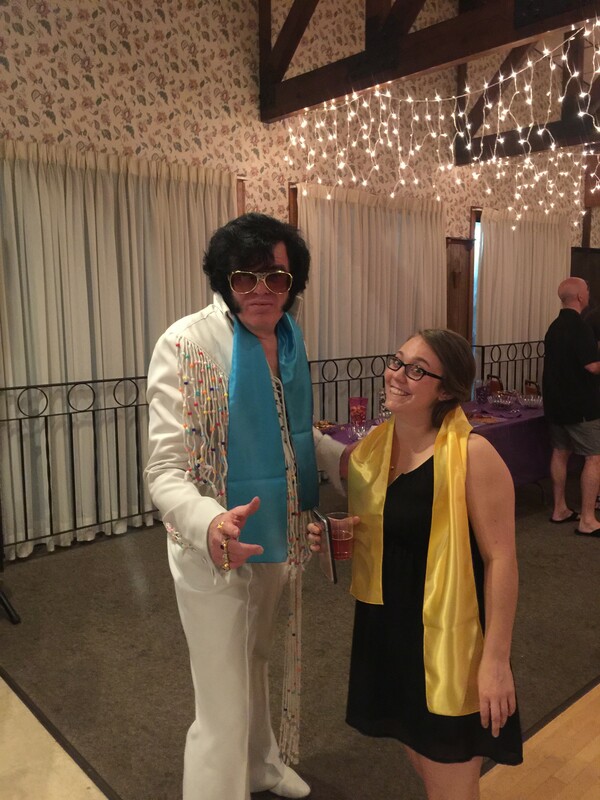 Keith would be the highlight of any event, as proven in this unusual circumstance! Thank you very much, Karen! I'm very flattered by your review but the kindness of yourself and Steve's family and friends in such a difficult time made the performance easy for me. I'm very glad you selected me, as I got as much out of the experience as everyone did. 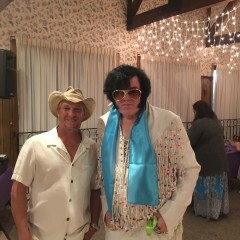 Keith did a amazing show for my cousin's wedding. On time, very accomodating. Thank you very much for the kind words, Lynn! My goal was to have a smile on your cousin's face the whole time, and I am glad I succeeded there. I hope I made it a memorable occasion for all the guests! 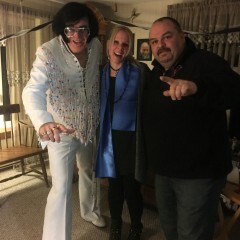 I hired Keith as a surprise for my wife's 60th birthday. My wife and her friends had a great time. It was a memorable birthday and great fun. I also appreciate that Keith was very flexible. We had to make various adjustments to time and location. Keith was very accommodating and it came off beautifully. I would highly recommend Keith. Thank you very much for the complimentary remarks, David! It helped that the group of ladies were so nice, and the clientele at the restaurant was also so appreciative and receptive. Also, A huge deal of credit goes to restaurant manager Kate, who was so supportive and helpful in the event going off as well as it did. Thank you for selecting me! Thanks, Chris! Great audiences make great performances, however, and your family, especially Norma, was delightful, making it easy. I enjoyed my visit quite a bit. Thank you, thank you very much! Keith made my wedding! 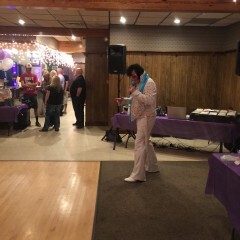 Everyone had a blast and he was fantastic! Thank you!! Thank you for the kind sentiments, Erin. I enjoyed performing for your group very much, and you are fortunate to have such wonderful friends and family. 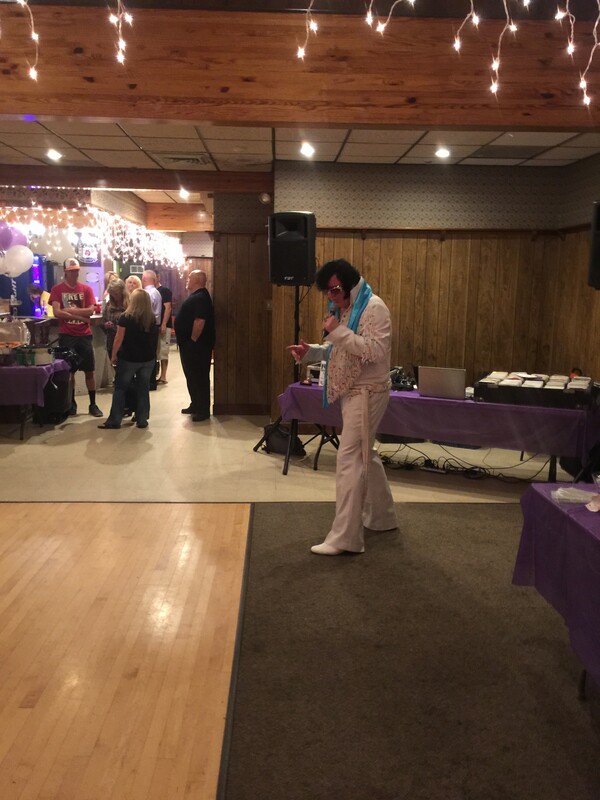 I especially enjoyed performing "Blue Suede Shoes" at your request. Perfect for our boy's celebration! 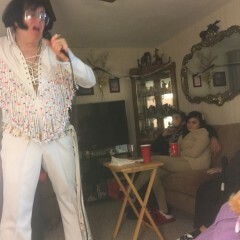 Dedicated to the full Elvis experience. 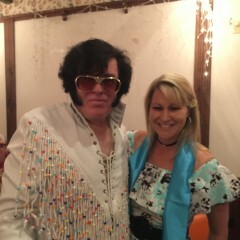 Thank you Elvis for a a fabulous BDay party at the Rose We all had a blast and your Danny Boy was the best!! 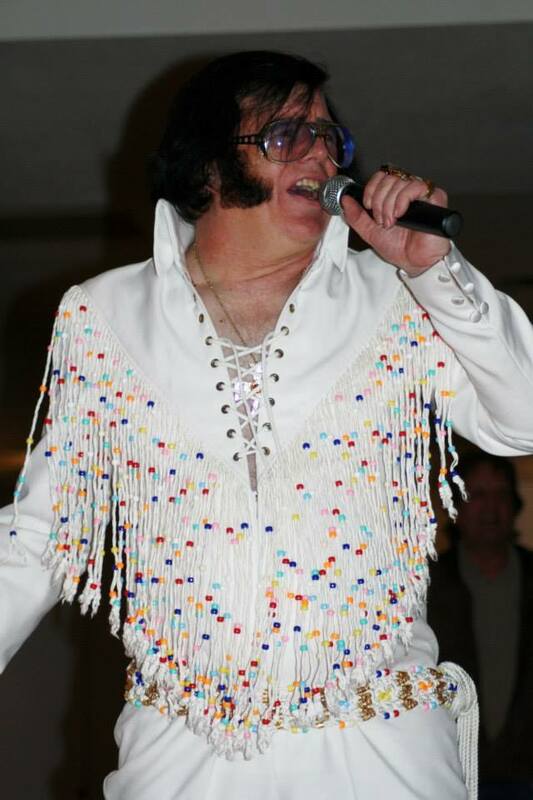 We definately will have you again at the next big event as you were key on with the best Elvis songs !! Thank you very much for the kind words, Clare! And, I'm glad you enjoyed "Danny Boy"; I've sung it a few times since your party, and it's become a favorite with clients! I appreciate everything you did to help me make the appearance become such a success. My grandmother is not doing so well. 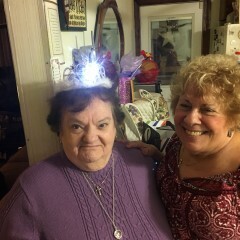 so my family and I decided to have a cheer grandma up party. Since my grandma can't go anywhere We had to have it in a house that wasn't that big and in a small livingroom and Keith made it work and did an amazing job..Keith Lewis was very nice and made sure that we had everything that we need.. He kept in touch every week until the party. I wanted to say thank you so much for all that you did. My grandmother was so excited and it did cheer her up. Thanks to you my family will have a great memory of this day! Thank you Karissa for the kind words. 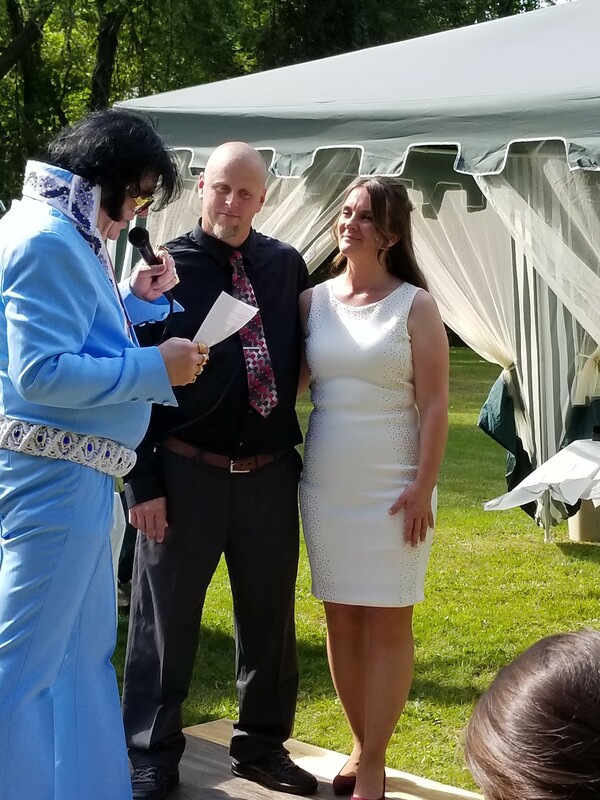 My goal, and my mission, was to bring some joy to Margaret's special day, and I'm glad that I was able to accomplish that. Seeing her smile so much was the greatest reward Saturday! 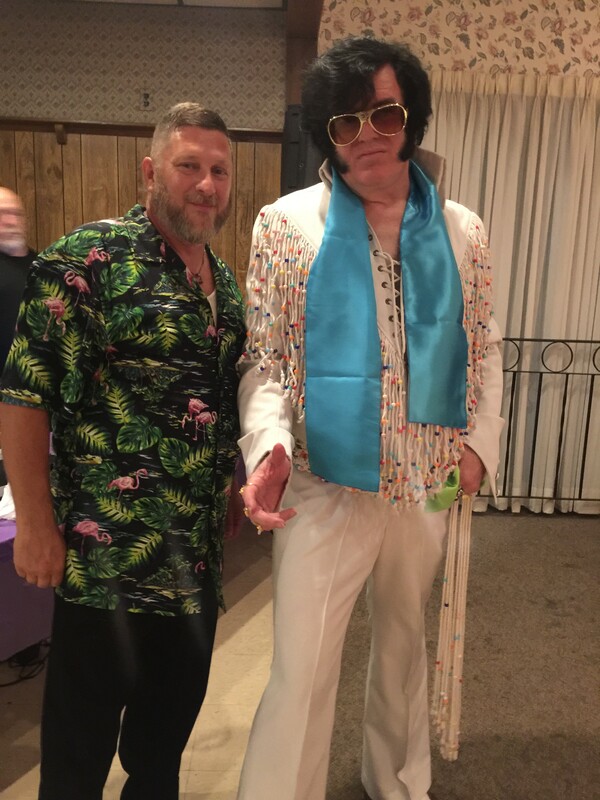 Keith does an excellent job as a tribute artist : for Elvis' music and for Dean Martin. His singing voice is so excellent, the crowd was so enthusiastic. People were taking photos with him...and the applause was awesome! The whole outfit was perfect and loved the variety of slow and fast songs . You've got to contact Keith for your next gig . Keith was very professional and was as concerned for every detail as I was. The event went perfect and his performance was enjoyed by all . 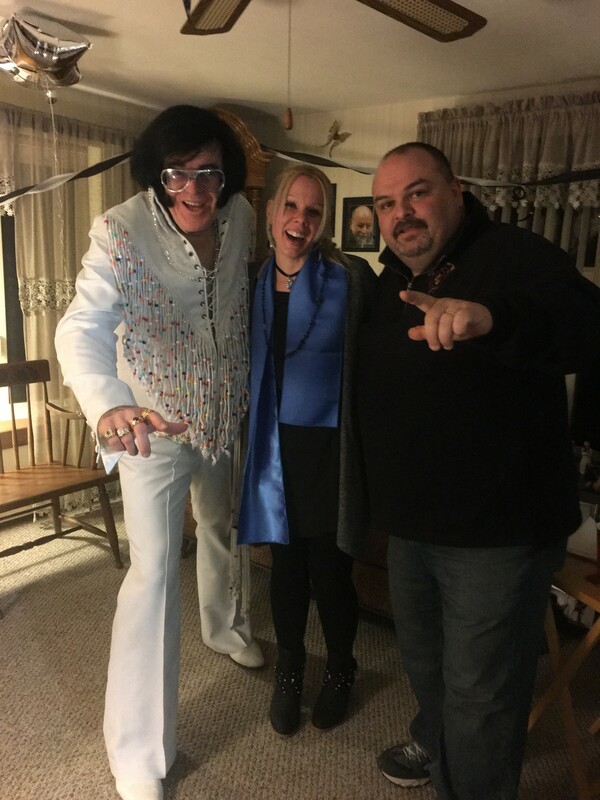 Great "Elvis" and would highly recommend him. Keith Lewis delivery of Elvis was exactly as advertised. He spent time with the planning, arrived on time, was friendly, prepared, provided lots of energy, was not in a hurry to leave and had the whole party dancing and rocking. 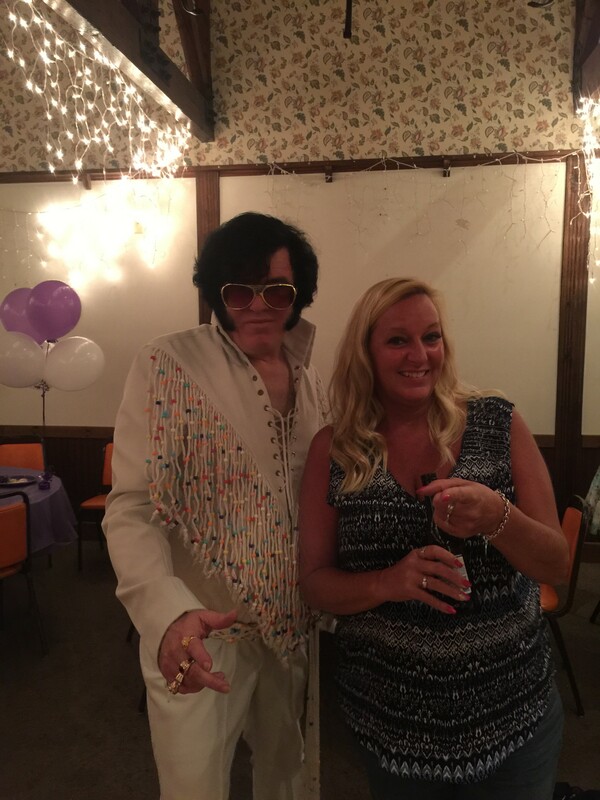 Everyone was very pleased and would certainly hire him again as Elvis or one of his other personalities. Hi Ed. Thank you very much for you flattery and very kind review! I have to admit that it certainly helped my performance with such a wonderful group of people, the group was really half the show. And one other thing between you and me, because if it happens I would want it to be a surprise and if it doesn't, then I wouldn't want to disappoint, but I sent an email to Diana and Tony at the Y asking about the possibilty of Elvis dropping in on the early class when the Elvis songs are playing... I thnk it would be fun to surprise everyone there, if possible. Again thank you, thank you very much! I have had the pleasure of including Keith on my roster at the Huron Club venue in Collingwood. 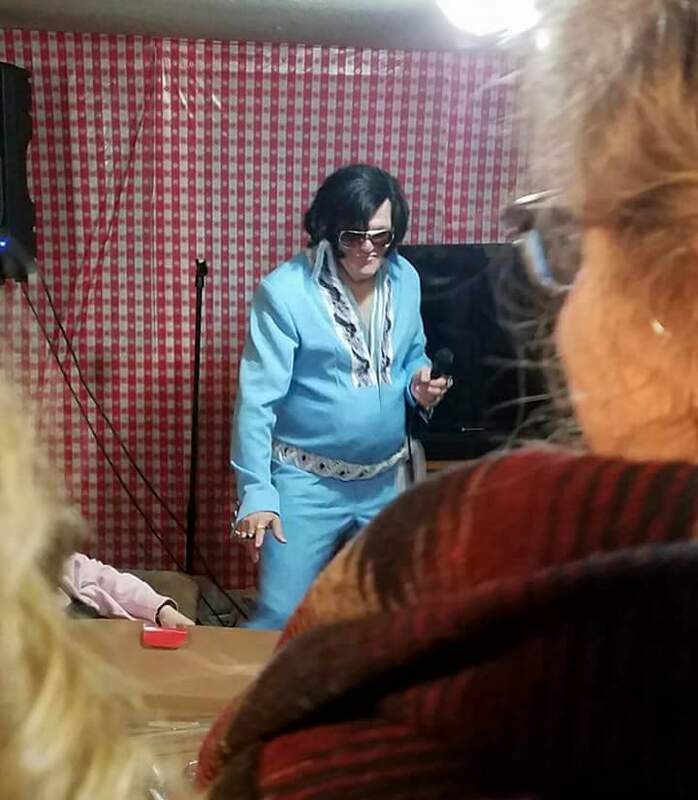 The past three years, we have played to a continually packed house on the Friday of the festival, and Keith never fails to provide a great show for the enthusiastic crowd of Elvis fans on hand. 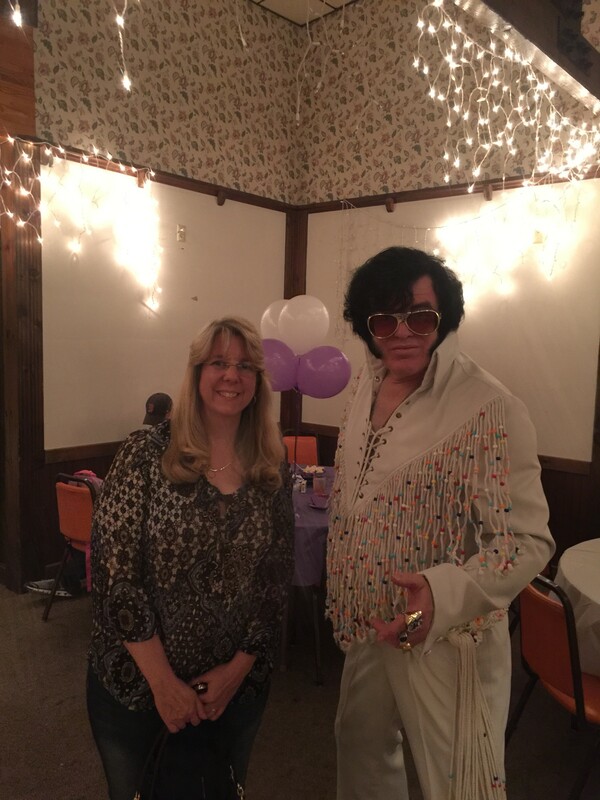 His spirit and devotion to detail and his knowledge of Elvis and his music..and his outgoing personality stand out. I am regularly asked to organize Sunday Gospel shows at a number of festivals that I attend -- and I always look forward to having Keith involved...His tribute comes from the heart -- and it shows. Thank you very much for the kind words, and the kindness you all showed me at the bitthday party. I'm so glad you all enjoyed my small part in making it a success. I also hope that your nephew gets drafted by the Red Sox when he graduates! 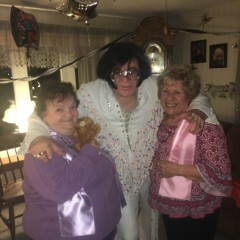 We had Keith at our Ladies Night Christmas Party and he was great. He did two, twelve song sets in two different costumes and finished up giving one of the ladies his scarf. Give him a call for your function, you won't be disappointed. 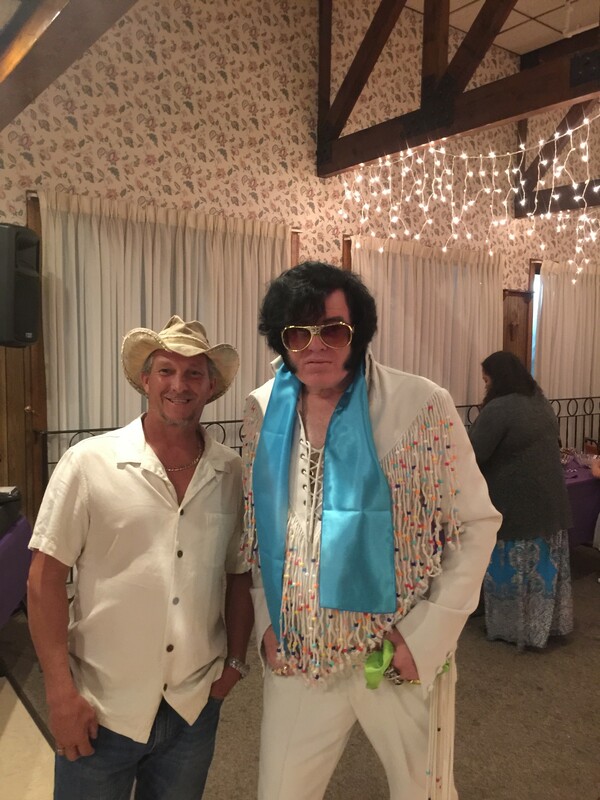 ELVIS AND DEAN MARTIN "A TRUE PRO"
I HAVE DONE OVER 600 SHOW IN THE LAST 42 YEARS AND KEITH HAS BEEN ONE OF THE BEST ELVIS AND DEAN MARTIN TRIBUTE ARTIST THAT I HAVE HIRED. ANY BODY IN THE BOSTON AREA SHOULD GIVE HIM A CALL. "TRUE PRO"
HE HAS DONE ABOUT 22 SHOWS FOR ME. Vocalizations in the style, mannerisms and voice of the artist I am performing as at the time, as well as the dress and appearance of the artist, a willingness to pose for photos and a desire to leave the audience and honorees with smiles on their faces through my performance, attitude and sense of humor. 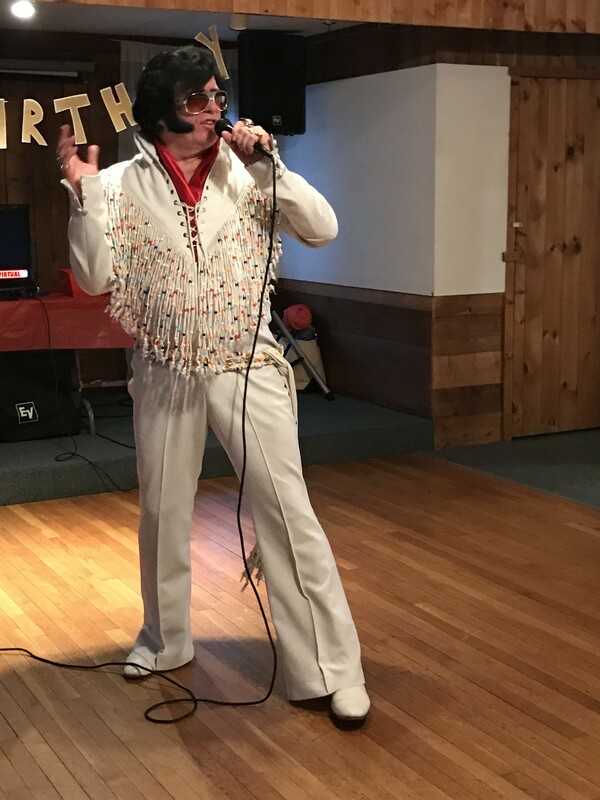 I am a multi-award winning Elvis Presley Tribute Artist, who has performed throughout New England and Ontario in both large and small venues for the past nine years. 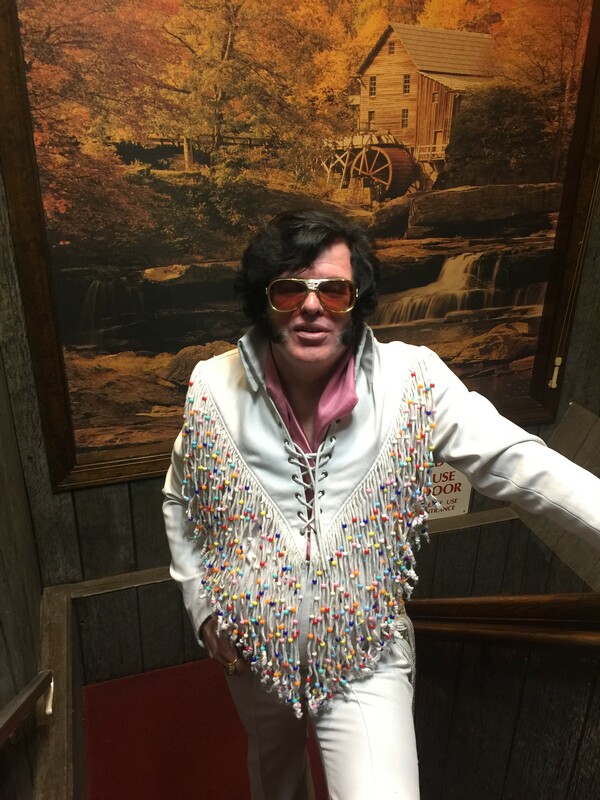 My shows include actual singing in the style and vocals of Elvis Presley, and authentic Elvis costuming, including jewelry by Lowell Hays, who designed and created all Elvis' rings and chains. 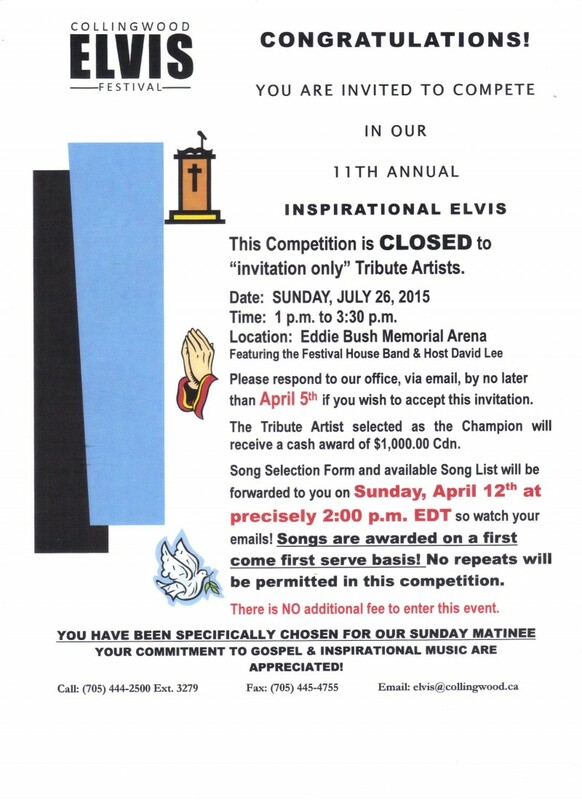 The 2013 recipient of the Tweed Elvis Festival Spirit Award and 2014 recipient of the Barrie Rock and Roll Festival Spirit of Elvis Award, I have also competed in contests across Ontario, including Windsor, Collingwood, Barrie and Tweed, including the annual invitation-only Collingwood Elvis Festival inspirational contest. 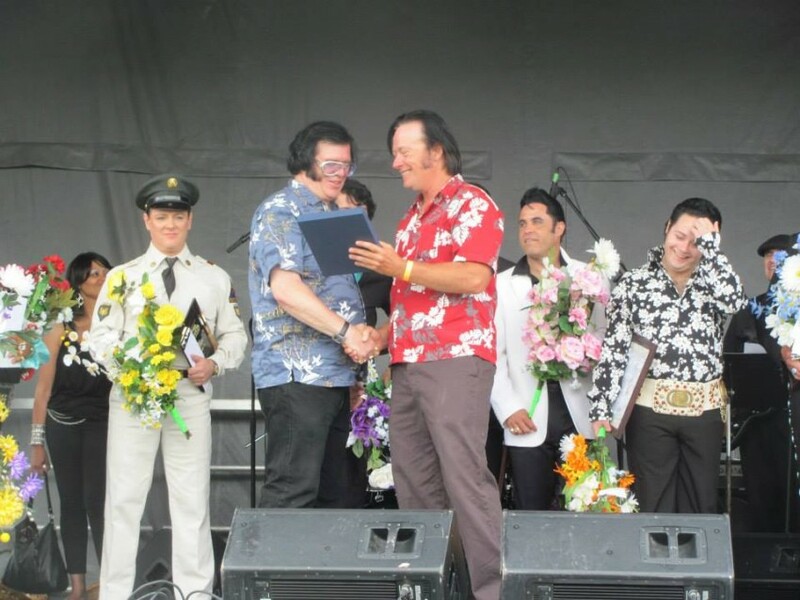 Most recently, I was a finalist in the 2014 Barrie Festival and finished third in the 2015 "A Night With Elvis" competition in Rhode Island. 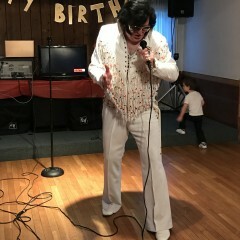 I specialize in the 1970s jumpsuit era, although I can also sing in the earlier Elvis style and do songs from all eras. A classically trained vocalist, I not only can mimic other popular singers (having also done tributes to Dean Martin and Johnnie Ray), but have performed in tribute bands, barbershop quartets and select madrigal choirs, as well as in musical theater. I am known for my sense of humor, which I always bring to the stage, and my mission is to entertain, which is why my shows are always for and about the audiences, the reason I am there. My set list changes based upon the needs of the performance, such as adding Christmas songs for holiday performances and patriotic songs, such as "American Trilogy" for shows for veterans or Fourth of July. 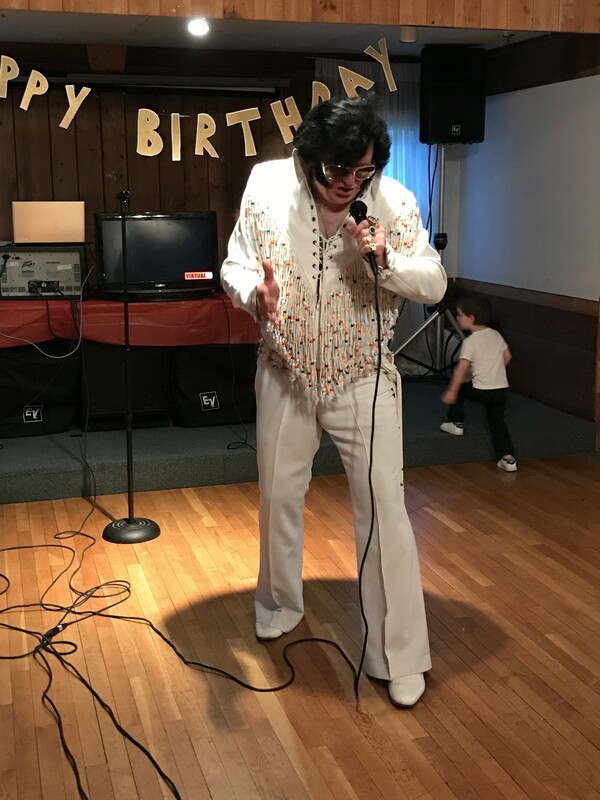 With actual backtracks rather than cheaply made karaoke versions, I can also sing the Elvis version of "Happy Birthday" for those events, and will try to change a set list ahead of time to include a personal favorite if it's one I know or can learn in time for the specified show. 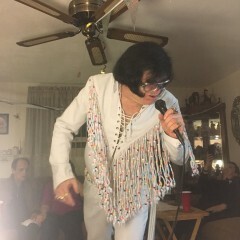 My regular set list often begins with early Elvis favorites, like "Blue Suede Shoes" and builds to the Vegas years favorites, such as "Burning Love."